South Australian (SA) defender, Jaslynne Smith was drawn to Australian Rules because of the sport’s physical aspect. She says there’s nobody who articulates the physicality better than Adelaide Crows midfielder, Ebony Marinoff, who is inspiring Smith to achieve her dream of playing AFL Women’s. Smith’s AFLW dream stemmed from kicking the football around with her Dad. After telling him she wanted to take up the sport competitively, he got right to work and helped his daughter play the sport she loves. Smith says her friendships have kept her in the game, as well as her enjoyment of the sport. Her goal to go as far as she can with Aussie Rules was inspired by the creation of the AFL Women’s competition in 2017. This ignited the hope in Smith to take her football career beyond club level. Smith has already enjoyed matching up against some bigger bodies in the South Australian National Football League (SANFL) Women’s league this year. She admitted that it was challenging at first, but she found her feet very quickly. Once she got used to the physicality of the SANFL Women’s, Smith got to play in a premiership for her side, South Adelaide, which is one of her favourite football memories. “That was a really special moment and we all worked really hard throughout the year and in the pre-season, so getting the Grand Final win was something special,” she said. Smith has also enjoyed playing in some high-standard Under 18 games for South Australia and the Central Allies. She believes that the standard has increased each year and attributes this to the growth of female football. Under 18s football has also been beneficial for Smith individually, as she went from a utility to a defender. This year, she and her South Australian teammates combined with the Northern Territory players in the AFL Women’s Under 18 Championships. Smith said that although there was limited time to get to know the players, she enjoyed the experience of playing with them on the Gold Coast. Like every young footballer, Smith is eyeing off a career outside of football to keep her options open. THE story of the day was Queensland getting an upset win over Vic Metro in the AFL Women’s Under 18 Championships in a wonderful performance. The other winners of the day were in-form teams, Vic Country and Western Australia. Julia Montesano and Peter Williams were there to take notes on all the action that unfolded. Played a fantastic game for Queensland and was one of their key players during the game. Delivered a nice composed kick to a teammate in the back half, showing composure with the ball in hand. Also demonstrated great run and carry which was highly effective in the fast-paced game. Her tackling was particularly a highlight as she laid an excellent run-down tackle to win herself the opportunity to create a scoring shot for Queensland. Farquharson was the game-changer for Queensland, kicking the last two goals of the game to seal the upset win for her side. One goal was truly wonderful, as she kicked it from a difficult angle near the boundary line on the run. Her second goal bought the house down, as it proved to be the match-winner and was reward for her hard work during the day. She ran hard inside 50 and showed good acceleration when she needed to. Displayed excellent run and carry through the forward line and was a jet inside 50. Her tackling was aggressive and it paid off, as she was able to put forward pressure on the Metro defenders. Displayed great agility to kick a goal, which was a highlight of her game. Delivered a nice kick into the forward line to a player on the lead and laid a good tackle inside 50 to dispossess the ball of her opponent in a danger zone. Followed this up with another great tackle on Maddy Brancatisano, stopping her in her tracks. 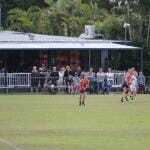 Delivered a perfect centering kick to a player in the forward line, demonstrating her great kicking. Also combined it with her agility when she executed a clean pick up off the deck and delivered a nice kick down the line. Laid a lovely run-down tackle in middle of the ground in the first quarter and won a free kick for efforts. Groves-Little did some clever things throughout the game such as executing a great slide to trap the ball. Did well to execute a great pick-up off the deck and followed this up by displaying wonderful running down the win. When she aimed to spoil and it didn’t work out for her, she immediately tackled her opponent, displaying a good second effort. Displayed nice agility to dodge around her opponents and get the handball away. Backed this up with a great pick-up off the deck, followed by a clever spin around her opponents and a nice kick while being held. Also took a great mark running back with the flight of the ball, demonstrating her good intercept work. Provided good run and carry for Queensland and ran into space well. Took a great contested mark and also took a fantastic intercept diving mark, demonstrating strong hands. A highlight of her game was when she emerged out of a park and accelerated well with the ball in hand. Executed a great side step around two opponents to run into a goal just outside the goal square, which was Queensland’s first major of the day. Executed a great kick around her body inside 50 and gave off a great quick-fire handball to Zimmorlei Farquharson who was streaming into goal, being the catalyst for that game-changing passage of play. Led well and took a great mark lace-out. Also showed good composure to lower her eyes and spot up Serene Watson on the wing. Took a nice mark in the centre of the ground. Although she knew she had space, she didn’t blaze away, showing good composure. Laid a great tackle to put the pressure on Metro in a stoppage. Demonstrated great reading of the footy when she trapped it behind the back the back of the pack. A great role player for Queensland. Executed a good pick-up off the deck and a nice kick down the line. Delivered a nice high kick inside 50 and showed great run and carry before she disposed of the ball, highlighting her exciting pace. Gave her teammates the opportunity to attack footy in space with these kicks, proving to be very important in terms of forward 50 entries. Did well to trap the ball after she dropped the mark and executed a nice kick around her body, showing her clever footwork. 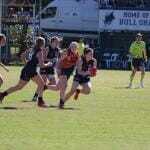 Bella fought hard in the ruck and did extremely well, bringing the ball down well for her midfielders. She took a good intercept mark in the middle of the ground to send it back forward for Queensland, displaying good composure under pressure. Competed hard all day and is having a really consistent tournament. Had a really promising start to the game, working in close and using her superior vision to find teammates on the outside. Her agility and ability to move swiftly through traffic was on show, and she covered the ground well. Another impressive game from the Calder Cannons skipper who just keeps on performing at a high level. She won plenty of the ball, often running into space and using her high work rate to work over her opponents and win the footy on the wing or in holes around the field. Prespakis kicked the final goal of the game, and while it was not enough to change the result, she finished the game with a terrific 20 disposals. She dropped back into defence and helped out, mopping up on a number of occasions. Clean, classy and versatile, Patrikios spent some time at half-back as she did in game one, then would push up the ground and use her foot skills to advantage in the front half. Just goes about her business well and rarely wastes a touch, kicking over all distances and having the perfect balance between inside and outside. One of Metro’s best in the game and was a rock at half-back intercepting everything she could. Macpherson took some fantastic intercept marks and rebounded out of the back 50, making the Queensland side have to pick their way through the set-up and put more pressure on her back there. Really strong one-on-one in the air and ground level. Another solid performance from the Sandringham Dragons midfielder who was often found in the middle of a contest, right at the coal face. In the opening term she took a strong mark and also won an important one-on-one along the wing. In a midfield full of stars, she was important on the inside. Newton played a really inside game and was often found handballing to teammates in space more so than her traditional long kicking. She still had a number of long bombs going forward, but covered the ground really well, winning the football in each third. A good four-quarter performance overall. Stood out across half-back and through the middle, particularly in the second half. She mopped up everything in defence best she could, and just found the ball with ease. Ended up with the second most disposals behind Prespakis and won the majority of them in a contest. Took some vital marks and spent plenty of time through the midfield. A really prominent opening term, Lynch was often the player her teammates released to on the outside as she ran past. A long kick of the football, she was not as influential as the first game, but still managed to find the football and use it fairly well. The exciting forward was strong and clean throughout the game and while she does not win a heap of the football, she uses it pretty well. In the second term she used her goal nous to pounce on a loose ball in the goal square and kick Metro’s first major of the game. An important defender for Metro, she had a really nice run along the wing in the second term and was able to rebound plenty in the second half. Thought her way through her kicks and stood tall when the defence was under siege in the final term. Did not win a heap of it, but booted a goal and set up another. 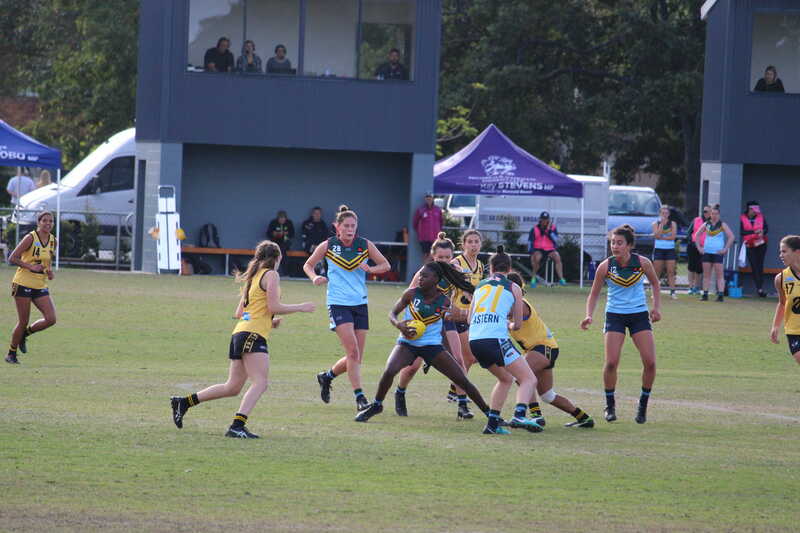 She took a good running mark in the second term and had a crack from long range, where it was spilt and Gabriella De Angelis managed to boot the goal. In the final term, a 50m penalty saw Bate kick the easiest of goals from the square. Used her trademark dash to create some run and carry down the field across the four quarters. She was strong in the contest in the final term, taking a good mark under pressure, and kept running with a series of handball receives and kicking forward to break through the opposition defensive zones. Always battled away hard, using her body underneath packs and laid some strong tackles. Courageously went up for a mark in the final term, backing back with danger coming from all sides, and despite not holding it, backed it up with second efforts. Just worked hard across four quarters rotating between midfield and up forward. Early on she had some great bursts out of congestion and was strong overhead and at ground level. In the second term, Hanks produced a great snap from the boundary line and she delivered a good pass to the advantage of Lucy McEvoy who won a free and goaled. A consistent, four-quarter effort. Played a really strong inside game, winning the ball at the coal face, then spreading into space where she was able to provide an option. Purcell also laid some strong tackles and linked up well in transition, often winning the ball at half-back or in the middle and sent it forward with interest. One of Country’s best, just needed to finish a little better. Had numerous opportunities and kicked four behinds. Despite this, she had the opportunities to hurt the opposition and was constantly involved in the play. Van De Heuvel created good run in the forward half and used her long kick to advantage. One of Vic Country’s top midfielders, Morrison backed up her top performance in the opening game with another sensational effort in the second match. She showed good vision and speed throughout, and had multiple bounces along the wing in the fourth term. Threw herself into contest after contest with little regard for her safety and took a really strong mark in the air, clunking it cleanly with pressure from behind. Almost like a defensive forward’s game, Webber was able to provide a target, while also working hard to lock the ball inside the forward 50. On paper she might not have won a lot of possessions, but every time she went near it, she was either putting pressure on an opponent, or opening up space for a teammate. She was rewarded for her hard work in the third term with a good mark on a lead and goal from a set shot. A really underrated performance and once that was worthy of being in the best. A strong captain’s game from the midfielder who managed to cover ground really well and find plenty of the football. She used her thumping kick to clear the defensive zone and go deep inside 50, and also took a number of intercept marks in the middle of the ground. Had a shot on goal from 50m after taking a bounce, but her shot had an unlucky bounce and bounced back into play. The ruck showed off her versatility by also playing forward and back, winning a lot of the ball in midfield, then taking some important grabs around the ground. Her last quarter was really important in defence, clunking a couple of contested intercept marks and clearing the zone when Central Allies attacked vigorously. Played on the inside and predominantly used her body to shield opponents from winning the easy clearance, particularly working hard against Nikki Gore when Gore was starting to take control in the middle. She laid a strong tackle in the third term to force a turnover, and continued to present around the ground. Another match-winning performance up forward from the bottom-ager who is so strong and smart inside 50. She booted her first goal in the second term, and then had an opportunistic moment in the moments later off the deck, while winning a freekkick and converting from 15m out in the third term, then running into an open goal in the final term. Just a dominant performance up forward. Worked her opponent well and restricted her direct opposition too much opportunity to do damage. Was outmarked by Katelyn Rosenzweig on one occasion giving away the free kick, but otherwise did really well. She charged out of defence, peeling off her opponent and providing a contest up the ground, and took some good intercept marks. Displayed great run and carry through the middle of the ground, as she just loves to get and go. She also did well defensively when she caught her opponent in a tackle and did well to dispose her of the ball. Made a real impact in this game with two of her side’s three goals. Kicked a great goal from just inside the boundary line to kickstart her day. Displayed great reading of the play to run onto the ball for her second major. I thought her hands were also strong and were handy up forward for the Allies. Munyard for me was one of the Allies’ key players and was also a good role player in Monday’s match. Plays a real team role and shows great hunger to win the ball. Did well during the game to show clean hands when picking the ball up off the deck, following this up with getting a kick away. Delivered a nice composed centering kick to an opponent in another instance, showing composure when she gets the ball on her foot. Also showed her aggressive side when she laid a great run-down tackle on Sophie Van De Huevel to stop her in her tracks. Dunstan’s hands were superb on the day as she used great body work to take a defensive mark. Followed this up with a good lead-up mark in defensive 50 to stop Country from penetrating forward. Used her body well to take a lovey contested mark, using her strong hands to effect. Also demonstrated nice kicking when she executed a good kick down the line. Kicked a long ball out of defence that gave her teammates opportunity to run onto it. Showed courage when she ran back with the flight of the ball and got a kick away. Did well to trap the footy and cause a stoppage after some good run and carry from Vic Country was showing worrying signs for Queensland. Trapped the ball well and followed it up by smothering Tyla Hanks’ kick towards goal. Took a great mark and displayed good run and carry to stream away immediately, showing great footy smarts and acceleration. Demonstrated good strength in a one-on-one defensive contest and also when she was able to fend-off a player and get the handball away. A highlight of her game was when she laid an excellent smother on the last line of defence to save a certain Rene Caris goal. Executed a great spoil that prevented a mark inside 50 for Country’s Rene Caris. She then took a great mark on the last line of defence to prevent a goal, showing her defensive prowess. Used good body work on Amy Dunn as well, demonstrating that she is talented in many defensive areas. Hyde came to life in the second half, kicking all three of her goals in that period. Nothing is to be taken away from her first half though as she showed consistent hunger to win the footy. Displayed nice run and carry throughout the match and also good composure, such as when she handballed the footy backwards to create time inside 50 rather than blaze into the goals. Hyde kept running after the ball even when she got tackled, showing her intent to go hard at the footy and take heavy hits. Her leading towards the footy was superb and she blew me away when explosively led to the ball to kick her first major of the game. For her second goal, she got on the end of a downfield free kick and kicked the goal from a difficult angle. Ran in for her third major of the day in a great forward display. Laid a great tackle to dispossess her opponent of the footy. Also delivered a nice kick towards the centre of the ground. Showed great agility when she executed a nice pick up and quick kick out of the pack. A very agile player who runs well across the ground. Duffy is one of the most composed players I have seen and is great to watch. Took a great one-on-one intercept mark from a full back kick in and then executed a great pick-up in defence. This was followed by lovely run and carry down the wing of the ground, displaying her exciting speed. Read the play well when it came off a pack and composed herself well with a kick to the wing. I thought she did really well on the last line of defence when she was there. Did well to take the game on out of full back when she played on to herself and provided great run and carry. Kicked a bullet of a ball to Mikayla Hyde which was outstanding, as it displays the variety of kicks she can pull off. Took a great intercept mark and displayed wonderful run and carry once again to create a chance for Western Australia up forward. Like Duffy, Sergeant is another composed player who is a great user of the footy. Her intercept marking was amazing, and she was often in the right spots to send the ball straight back inside 50 for Western Australia. Sergeant also read the play well and showed excellent desperation to get the handball out to Ella Smith while she was falling over near the boundary line. Carling was buzzing around the contest and tackling hard all day. She picked up the ball well and showed agility when she performed a good spin inside 50. A highlight of her game was when she laid a great tackle to dispossess her opponent of the ball. Dowrick was influential as always, being a playmaker in her side’s victory. She took a good mark down the line and also delivered a great long kick towards inside 50. Used this long kick again down the line, which gave her teammates the opportunity to win the ball aerially. Accelerated well out of a pack and followed it up with a good quick-fire handball to Sabreena Duffy. Showed her kicking prowess again when she excellently pinpointed kick down the line to Ella Smith. Did well defensively too when she laid a great smother to save a kick for goal inside 50. Dowrick is one of the most aggressive players I’ve seen which is a fantastic trait of hers. Blew me away when she executed an excellent pick-up off the deck and had a great long range punt at goal that sailed through. Displayed good hands when handballing and also marking, such as when she executed a great lead up mark in the forward line. Laid a clever tackle late in the match where she didn’t exactly dispossess her opponent of the ball, instead simply snatching it out of her hand. Dowrick goes hard at every ball and is always hungry to win it. O’Driscoll was solid all day for Western Australia, simply playing her role and not overdoing it. She showed a great burst of acceleration with the ball in hand out of defensive 50. Also laid a great tackle on Chloe Haines to save a certain goal, which was a fantastic effort. A smooth mover who was once again among the Eastern Allies’ best. She thinks her way through situations and has a nice blend of pace, acceleration and agility to get out of trouble. Wins plenty of the ball and has a high work rate, laying strong tackles. Parker knows how to extract the ball out of a stoppage and always puts in a consistent four quarter effort. A classy player who is a quick thinker and has a smart sidestep. She used good pace and nous to trap the ball in the air and keep it in front of her during the third term, and just won the football in and around the contest, spreading to the outside. A real strong outside player who can also win the ball on the inside. Not as consistent across the four quarters as some, but the tools she has show her talent is untapped. She has good hands in traffic, a lovely burst of acceleration and a strong frame she uses to outmuscle and out-body her opponents. One of Eastern Allies’ top defenders on the day, she kicked long out of the back 50 and was really consistent in her defensive efforts across the four quarters. The highlight was a fantastic goal-saving tackle on the last line on the red-hot Mikayla Hyde in the second term to deny her an easy goal. Just has that raw talent and X-factor, while the consistency is not there yet, you get the sense with time and development it will piece together. She has elite acceleration and her ability to close down opponents in short spaces of time is exciting. Garlo also hunts the opposition when they have the ball and is a strong pressure player. In the opening term she used her acceleration to lock the ball in at a contest against two opposition players and did well not to be caught holding the ball. Hamilton was another piece in the defensive puzzle for the Eastern Allies who was strong overhead and positioned herself at half-back. She took a number of good intercept marks and looked downfield to kick long and open up the game for her teammates. She was one of the top performers on the day and put pressure on her opponents throughout the match. One of Eastern Allies’ top players on the day, Chloe Haines was terrific across the ground, finding space on the wing, kicking long and then getting back and helping out the defence. She laid some great tackles to win a free kick in the midfield, then kicked the ball off the ground for a goal in the third term. She capped off her game with an important smother inside 50 in the final quarter to lock the ball in there. Was the main target up forward for the Eastern Allies across the four quarters and just missed opportunities to put it on the scoreboard early. She kicked a couple of behinds, but finally was rewarded for effort with a great goal on the run near the boundary line in the third term just before the siren. Constantly involved in the play up forward and made multiple leads, working hard to double back towards goal. Played primarily in defence and moved up the ground at times, Libby Haines was another in the Eastern Allies best. In the first term she laid two fantastic smothers showing a great defensive intent, then laid a great tackle on the wing in the second term to dispossess her opponent and kick long. She took a strong one-on-one mark in the third term and kicked clear, then showed good vision at half-back to handball to a teammate in space.